President Obama's Executive Order 13547 issued July 19, further extends federal power, embraces global governance, diminishes the rights and privileges of individuals, and brings the United States into compliance with Agenda 21. Obama's expansion of government is taking the nation in the wrong direction. The federal government should be pushed back inside the bottle of those limited powers defined in Article 1 Section 8 of the U.S. Constitution. States and individuals should reclaim the power given to them by the Constitution and guaranteed by the 10th Amendment. In a quest to find a conservative way to be “green” some politicians are compromising and signing contracts with non-governmental entities and accepting funding which ultimately bind cities, counties, and states to radical environmental policies. Regulations and laws continue to be forced onto us by leaders that may not realize they have unwittingly committed us to anti-Constitutional globalist plans. As the federal "Cap and Trade" bill falters in Congress, and resistance to the EPA's 18,000 page new regulation document grows, globalists are trying to bring about expanded control, using the discredited excuse of man made global warming, on a state and local level. By Max Thornsberry, 5/1/2010 - The United States Department of Agriculture (USDA) was once a partner in the disease prevention of cattle but in recent years the USDA has knowingly allowed the continued reintroduction of bovine tuberculosis (TB) and other diseases that infect U.S. livestock. By Henry Lamb, 4/23/2010 - Houston County Landowners Concerned About Property Rights has been working for years to prevent a "Comprehensive Plan," contrived in the pursuit of sustainable development. The county adopted a comprehensive plan that ignored private property rights and the principles of freedom. Landowners fought back. This is a recent alert from Henry Lamb of Sovereignty International, Inc.
By Michael Shaw, 4/21/2009 - There are a thousand points of darkness that are now wafting upon us. What are Americans supposed to do, fight a thousand battles? No. 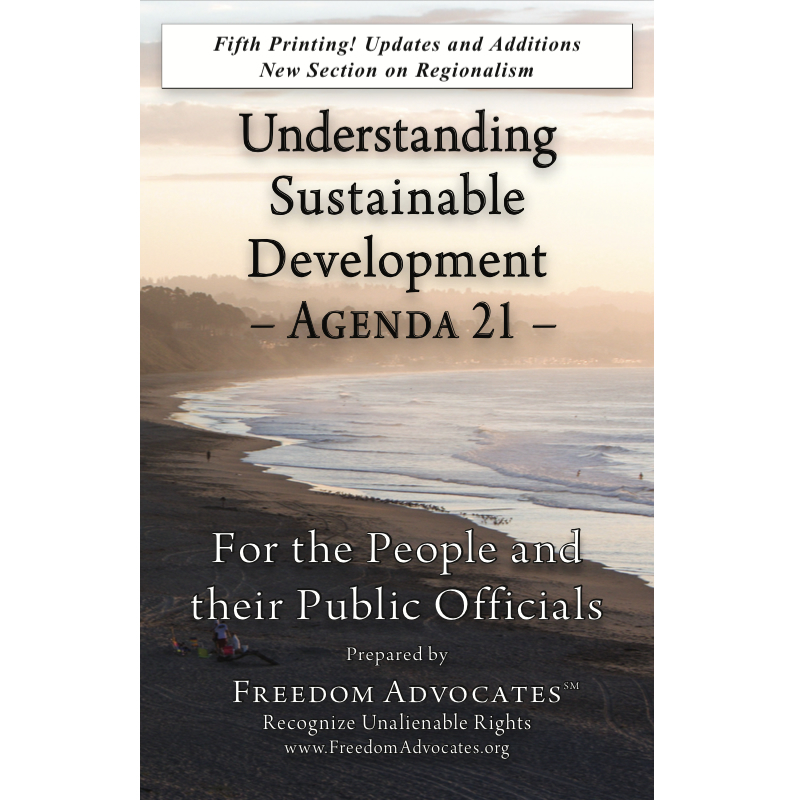 If we understand how Sustainable Development operates, we can protect unalienable rights and individual liberty. Understand the philosophy behind Sustainable Development and know the importance of unalienable rights rather than settling for immediate self-serving solutions. That way we will not only avoid future battles, but we will also win! Are Local Issues Affecting Your Family, Home and Resources? Boulder Creek, CA: Troubled by local government decisions affecting your family, home and neighborhood? Wondering about the competency of agencies managing (controlling) water, housing and transportation? The American culture is experiencing the consequences of declining individual responsibility and rising dependency. The genuine free trade principles that guide an honest economy have been abandoned. By Henry Lamb, 10/26/2008 - October 24 was U.N. day, celebrated by many as the birthday of the United Nations. In its 63 years of operation, it has spent untold billions of dollars in its quest to create global governance. Its goal is almost in its grasp. European leaders are pushing for a summit meeting with President Bush to create a new global “central bank,” with the authority to control global monetary policy in much the same way U.S. monetary policy is controlled by the Federal Reserve.